It was on a freezing cold morning on the way the way to school that the idea of Scooterearz was born! At the time we had 7 kids between us ranging in ages from 3-10, scooting to school in the winter was our daily commute. That said, it's not without its problems!! They all want to go at different paces and the whinging some mornings can seem endless!! 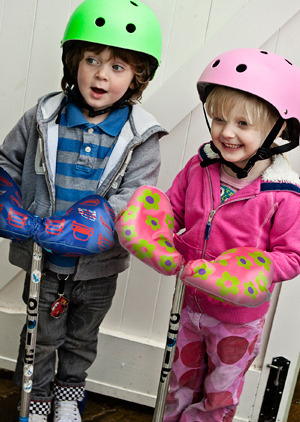 It was on one of these mornings when the kids had forgotten their gloves and were of course complaining all the way to school that their hands were cold that we came up with the idea - we managed to drop the kids off and head home for a warm drink and a brainstorm! We initially made some samples for use for our own children, however after receiving so many positive comments from other local mums asking where they could buy them that we decided to produce them ourselves. Vickie's background in Marketing and Elisa's in Graphic Design helped to point us in the right direction. It took nearly a year to get Scooterearz developed, manufactured and ready to sell but their success has been amazing. This gave us the courage to design complementing Bagz to add to our range, they simply attach to the front of your childs scooter or bike so they can carry their favourite things or a snack with them whilst they're out and about. Our family and friends have been such a positive support along the way and have really helped us at every step.